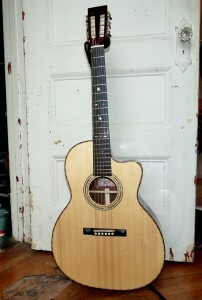 Specs Include: include a 16” wide, 4” deep, 21″ long Grand Auditorium body, cutaway, 12-fret neck, Brazilian rosewood back and side, Adirondack spruce top, scalloped braces, ebony fingerboard and bridge, snakewood binding, headstock plate and tuner buttons, two-piece mahogany neck, 1-13/16” width at nut. A mightily successful combination of traditional and contemporary design and construction, this wide-top, 12-fret cutaway guitar is light of weight but large in voice. With impressive projection and effortless volume, it has the woody, full-bodied lows of a cello, trebles that sustain like a well-played violin and some of the most richly complex chords this side of a baby grand piano. 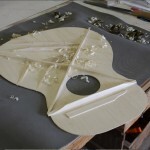 While other guitar makers have come out with a grand auditorium size that had a 12-fret neck, they retained the basic shape of a 14-fret guitar. 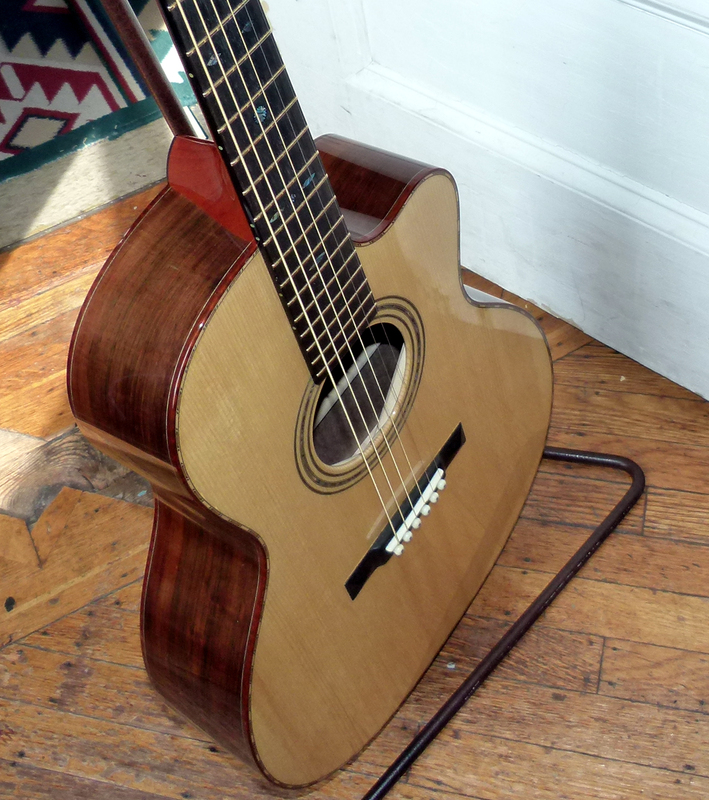 For the Quartet, designer Eric Schoenberg took the Martin’s 0000 size and re-imagined it as a true 12-fret rendition, complete with the elongated upper bout similar to that found on the historic 12-fret Martins made in the smaller 000 Auditorium, 00 Grand Concert, and 0 Concert sizes. This was known at Martin as the Standard design, as opposed to the Orchestra Model design, which squashed the upper bout to achieve 14 frets free from the body, as seen on most modern steel string guitars. Schoenberg credits Stephen Bruton, the highly respected Austin session guitarist and touring sideman, with coming up with the Standard 12-fret 0000 idea. Sadly, Bruton died before the first Quartet was completed, and Schoenberg named the model for his departed friend. I am certain this namesake would have met with Bruton’s highest approval. Guitars built in the Martin 12-fret mode have a uniquely full-bodied balance mixed with an “old wooden box” effect that simply isn’t found in 14-fret guitars. 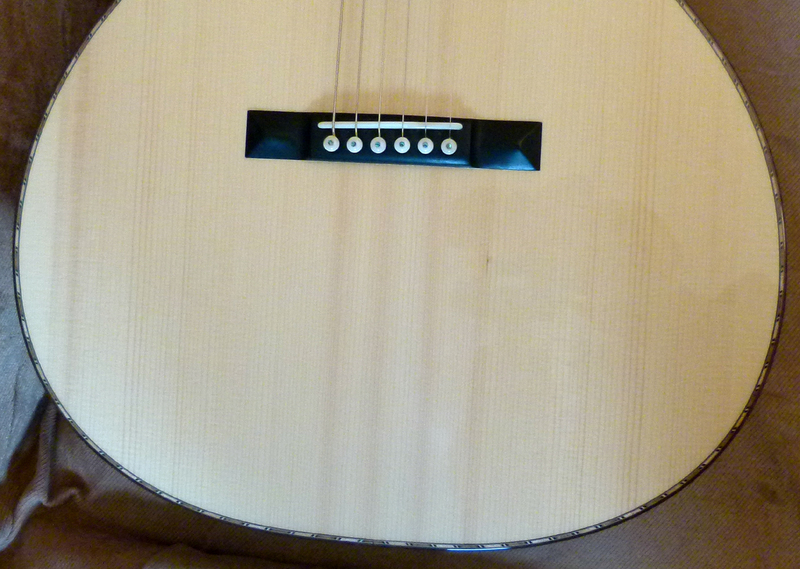 It is likely related to the extended upper bout, similar to a classical guitar. This results in a longer top, and a larger sound chamber relative to the depth of the body, while also changing the position of the bridge in relation to the top’s overall length. 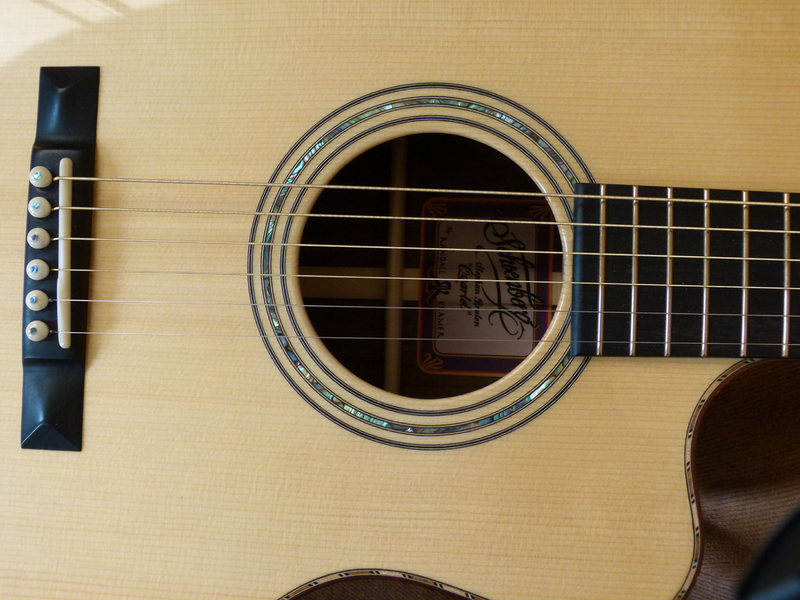 And this particular 12-fretter has the largest top this side of a 12-fret dreadnought. I was skeptical at the announcement of this new guitar. The Martin 000s can sound on the edge of tubby compared to the 00s. But my worries about the ratio of top area to depth vanished the moment I started to play the instrument. Guitars are often referred to as piano-like. In the case of this particular guitar, sustained chords really do remind me of a piano, as the fundamentals pop out and ring straight and clear, while the woody undertone hums below them and the angelic harmonics hover overall. At other times, this Quartet sounds more than a little like the classical string quartets that inspired its name. I often hear more than the usual three registers, fluctuating and resonating at notably different rates of “breathing” when they hang suspended in the room, as if a sculpted four-dimensional soundcape might almost become visible in the pregnant air around the guitarist. 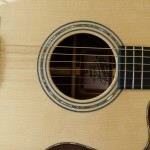 Many musicians wish guitars could have that 12-fretter sound with more frets available up the neck – along with an even bigger voice while avoiding the physical realities of the dreadnought or jumbo design, which require a shoulder-straining reach out over the deep body to access the strings. The Schoenberg Quartet meets all these requirements very well. 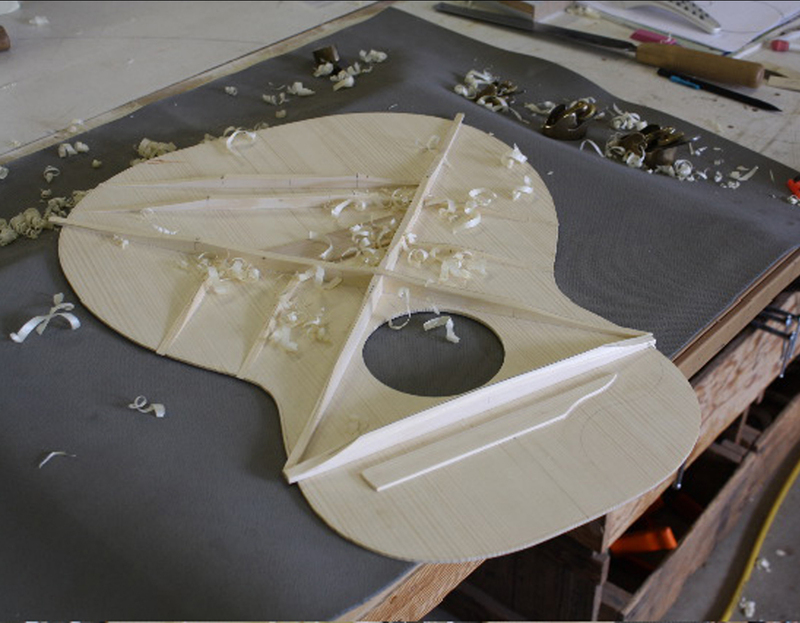 The wide 16″ soundboard increases the overall volume and provides increased bass response compared to other fingerstyle guitars like an OM. But the shallow 4″ depth of smaller guitars remains in place. So, there is still the quick reflection and popping projection of a 14-fret 00 or OM with the added bonus of the fatter yet balanced mid-range of a 12-fret 000, even as the lowest bass string provides an almost dreadnought-size throb. Simply put, it sounds wonderful. It is ridiculously responsive, effortlessly projecting, and voluminous not just in the level of sound, but in the refined richness. It is a joy to play lightly, but it stands up to a more robust attack, and for that matter it takes a flatpick pretty darn well too. 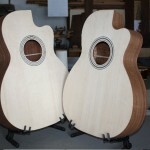 Randall Kramer builds his guitars in Truckee, California, a short ways north of Lake Tahoe. He was engaged by Eric Schoenberg to be the exclusive builder of the new Quartet model, as he has a knack for larger guitars and a meticulous craftsmanship. Kramer loves to work with wood in all sorts of ways beyond luthiery, and he certainly got to work with some great wood when making this guitar. 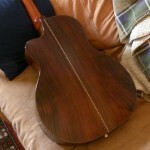 He has built the Quartet in different tonewoods, including koa and a particular Honduran rosewood from Panama, which, according to Schoenberg, shows promise as a replacement for the scarce and expensive Brazilian rosewood, providing enough can be acquired in the quality worthy of a Schoenberg guitar. The owner of this Quartet opted for Brazilian rosewood. It is on the browner side of hue, with some bronze sheen to the sides, although there are some reds that come out when the light strikes it just right. 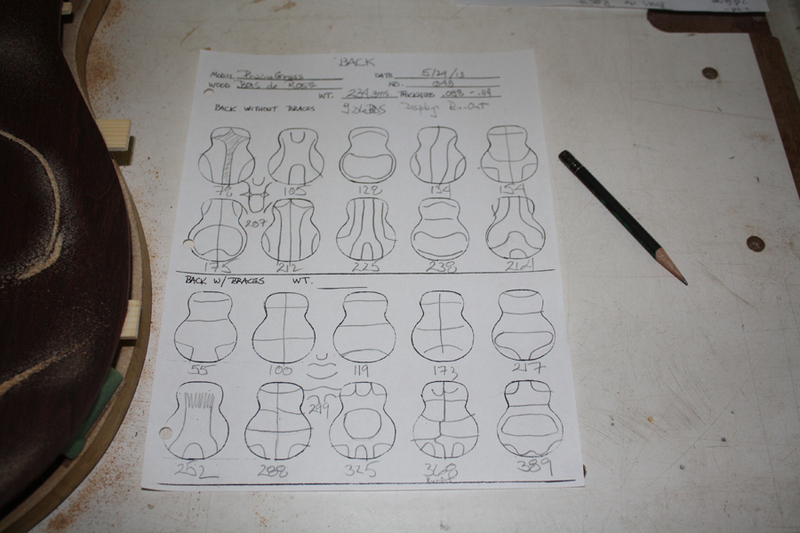 It has straight grain for the most part, with some outward curving as the back reaches the end of the lower bout. While it may not be particularly fancy, I have seen a lot worse Brazilian on modern guitars. It looks lovely, and it certainly has that unmatchable tone. As much as I like some of its closer cousins, I have yet to find anything with the luxuriant, bottomless lows of Brazilian rosewood, matched with such musical highs, and with as many colors in its complex tonal palette that spreads across the entire voice. 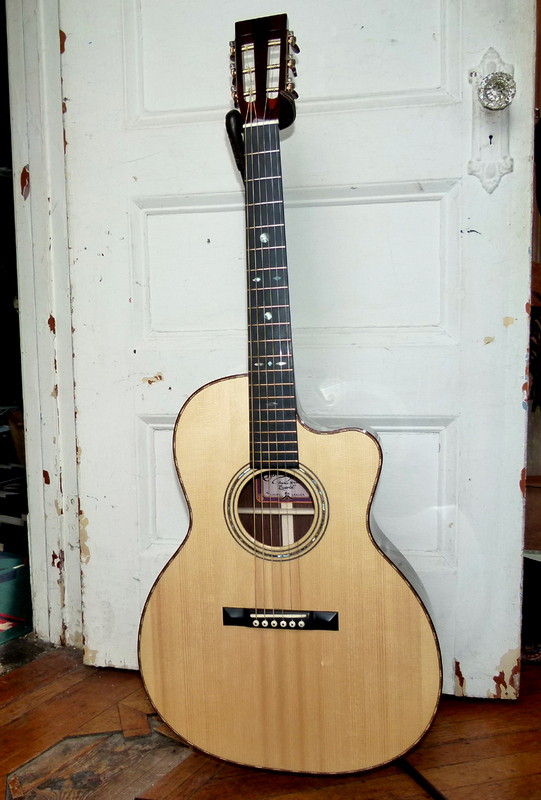 The Quartet comes with high-grade Adirondack red spruce for the soundboard. And this example has extensive cross-silking beyond what one often sees in Adi. My favorite choice for a Brazilian rosewood guitar, Adirondack spruce provides a high chime factor, while being otherwise transparent and highly reflective. The complexity of the tonal landscape emanating from the rosewood on this Quartet is perceived in breathtaking clarity, while the exceptional depth in the warm Brazilian bottom end retains great definition way down into the well. The fingerboard and traditional straight bridge are made from jet black ebony. The fingerboard is noticeably porous but the bridge is quite smooth. Kramer’s pyramids have a soft roundness to them compared to most others I have seen, which keeps the hard lines to the outline of the bridge when the light falls across the undulating curves. 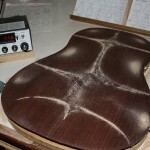 It is that kind of loving care in woodworking that makes me admire a guitar before I even start to play it. The neck is made from two halves of solid mahogany that are joined right down the center, and inside is a two-way adjustable steel truss rod, and the added support of two graphite fiber rods. This would account for the neck being so comfortably shallow. 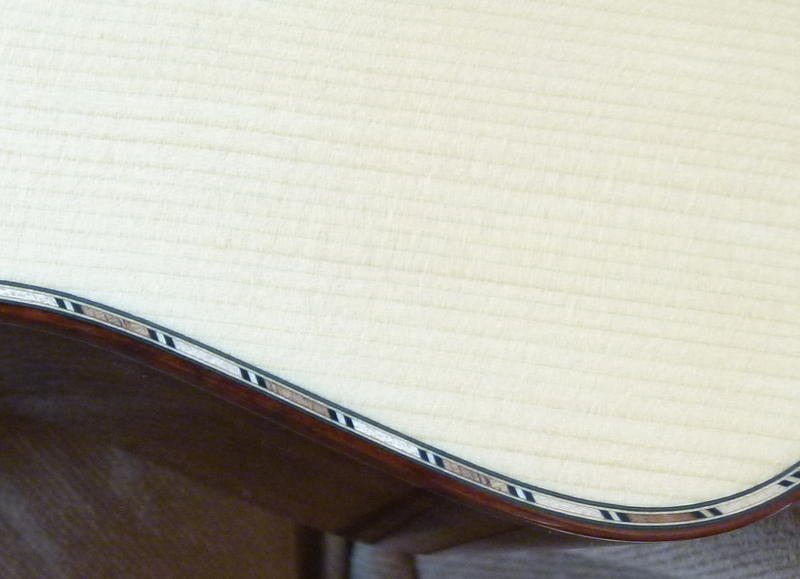 With a 1-13/16″ width at nut, the fingerboard is wider than on most steel string guitars, but the carving of the neck profile makes it seem narrower than it really is. 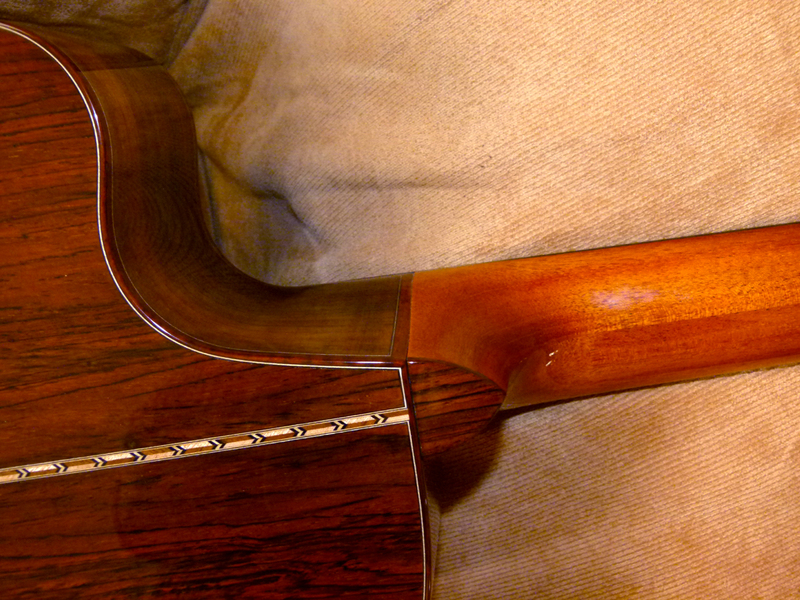 Even in the upper frets, I did not encounter the sort of discomfort I am accustomed to on wide, fingerstyle necks. The extra support inside means it is safe to carve it this low without fear that it will move as time goes by. 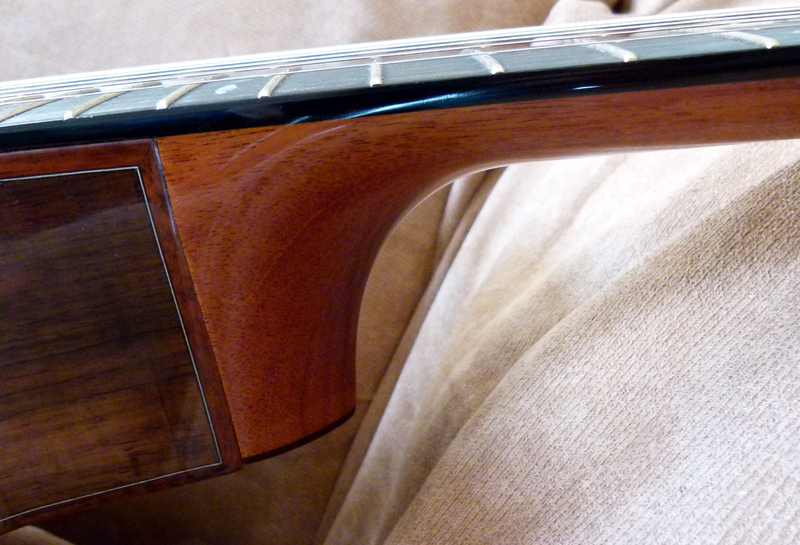 As it turns out the neck shape was a request of the customer, as is the 2-5/16″ string spacing. 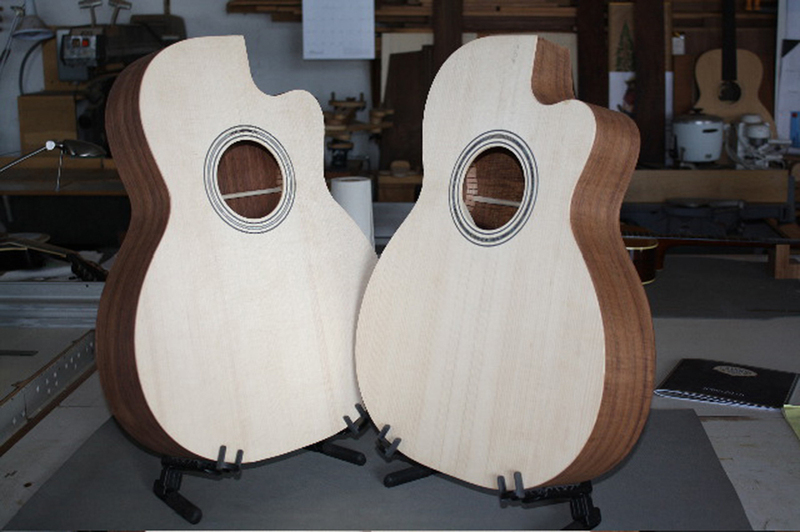 Schoenbergs tend to come with 2-3/8″ spacing and a relatively shallow V neck. 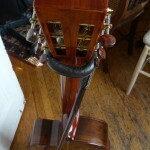 Other custom requests include the slotted headstock, which looks right at home with the Standard body shape. But having seen photos of the “paddle head” version, complete with the ornate Schoenberg logo, I think those look pretty cool too. 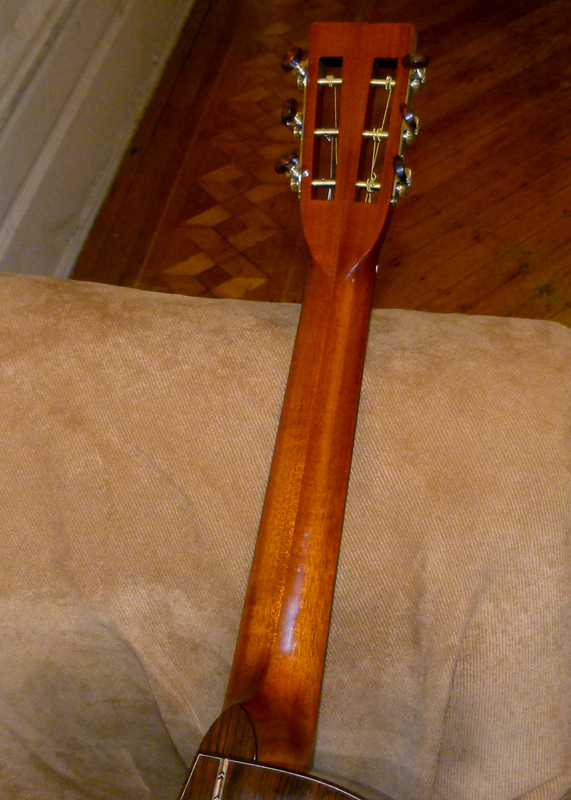 And then there is the short-scale neck, set at exactly 25″, one more reason it feels so comfortable to play. The stock Quartet, if you can call anything on a Schoenberg “stock”, comes with the usual 25.5″ long scale. This half-inch difference spared the high school football injury in my fretting hand a lot of wear and tear when it came to barre chords and stretches. But with the lighter build and lower string tension of the shorter scale, I might recommend medium gauge strings, or better yet, a mixed set like the Signature Bronze “True Medium” set from GHS, if a guitarist expects to spent a lot of time in dropped Celtic tunings. 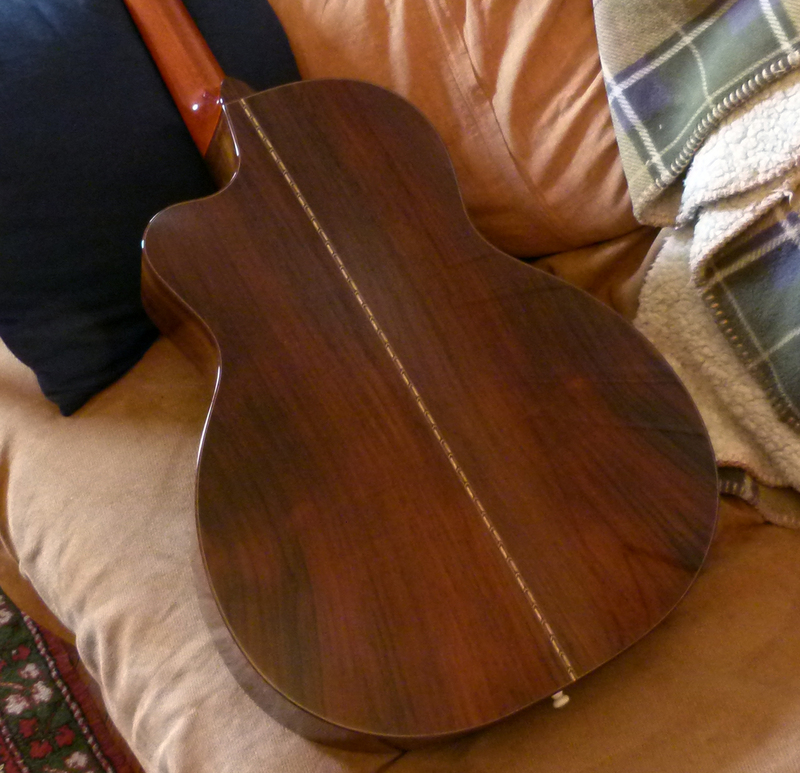 There are many guitars made in Brazilian rosewood and Adirondack spruce, but they are not all created equal. And there are not many as good as this one. 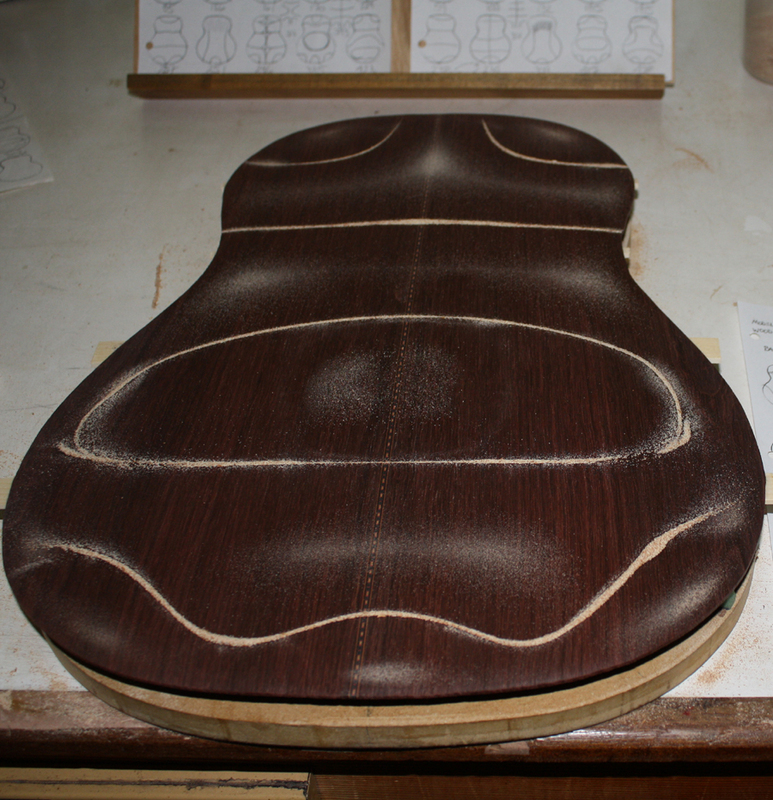 But then, there are not many luthiers with the patience, eye and skill of Mr. Kramer. His attention to detail is apparent everywhere I look, from the choice, mottled snakewood used for the binding, which ties in wonderfully with the bookmatched mineral striping on the top, to the splendid abalone fret markers of Old Style 42, with its snowflakes, diamonds and cats eye inlays chosen to work together as a glittering tableau, which ties in very nicely with the strip of high-color abalone used for the rosette. But the most delicious feature to be seen is the cutaway. Kramer bent the treble side in such a fashion that the cutaway comes almost perfectly flush with the heel of the mahogany neck. 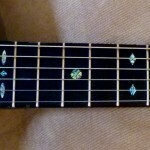 The major drawback of the standard 12-fret design is the fact it is a 12-fret design. I find it hard to get by without a cutaway on even a 14-fret guitar. Schoenberg apparently feels the same, as he has included a cutaway in all of his major models. 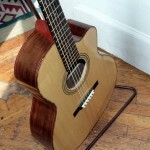 People have made 12-fret guitars with a cutaway before this, but they are often inadequate, barely allowing for the access of a typical 14-fret guitar. This cutaway is better. 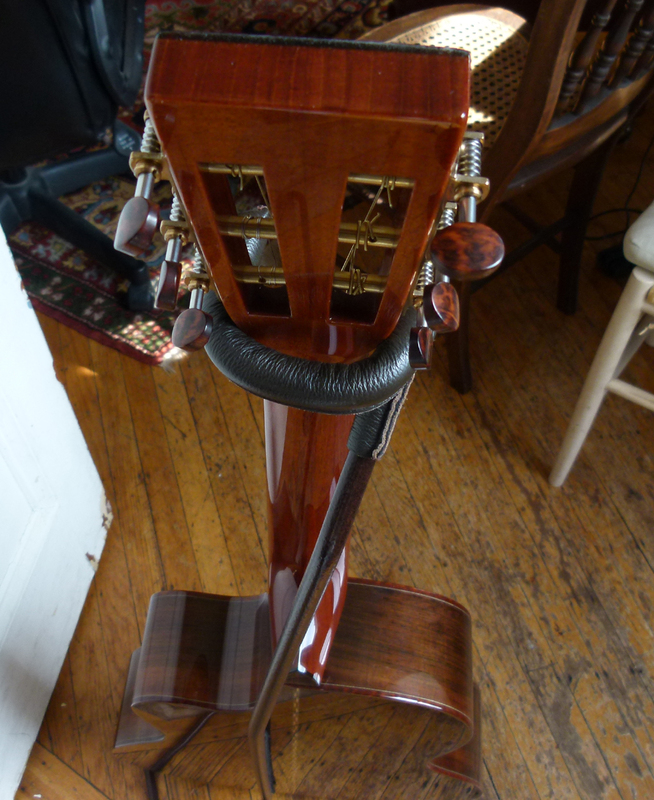 The extra room provided by the flush alignment to the narrow heel allows me to play the highest arpeggio in Laurence Juber’s arrangement of Strawberry Fields Forever, with only slightly more stress and strain. And that is about as far as my high-wire act goes. 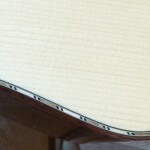 Despite the exquisite artistry exhibited on the outside of the guitar, it is the unseen craftsmanship included in the building of this guitar that is most impressive. 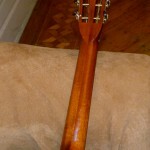 The fabulous cutaway is made possible by a narrow heel on the mahogany neck, which in turn is made possible by a narrow neck joint that was made nice and strong by the veteran woodworker, with the assistance of a solid mahogany neck block, and a long steel bolt to lock in it place and facilitate easy neck adjustments over the long haul. 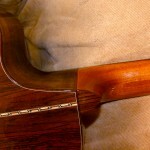 Michael Gurian is credited with inventing this type of modern neck joint, based on old carpentry techniques, and his guitars were heard all over 1970s albums by people like Jackson Browne and Paul Simon, until a fateful fire put him out of the guitar making business. Since then, versions of it have been tweaked and used with varying success. 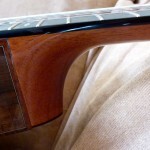 One advantage is a shallower, more comfortable neck profile in the upper frets. But critics often suggest that a wide neck joint, and a fat neck profile are necessary for a big voice and pure tone. 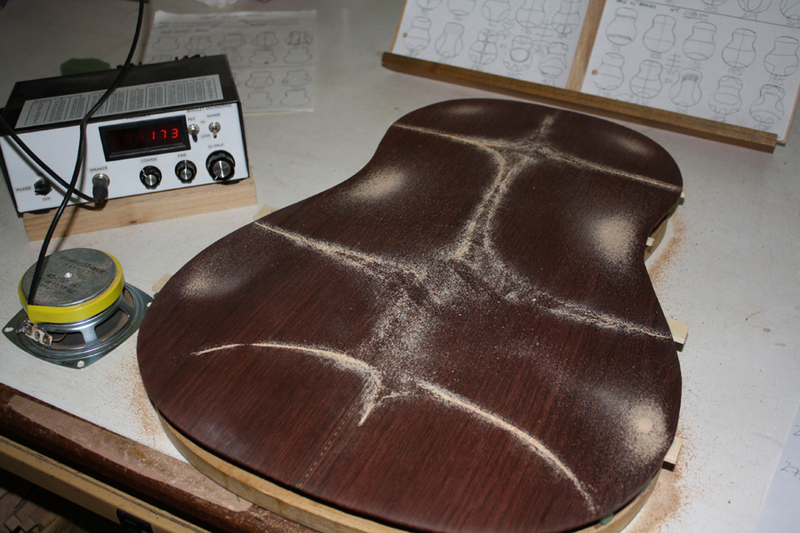 Luthiers like Randall Kramer have shown that is not always the case, if you know what you are doing. 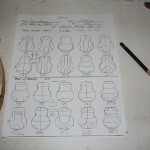 Kramer’s luthiery is based on the training he received from Mark Blanchard, and the science of eighteenth-century physicist Ernst Chladni, the Father of Acoustics. Chladni discovered that surfaces such as glass or metal plates resonate in certain ways when encountering different frequencies of vibration, such as sound waves. When small particles like iron filings are sprinkled on the plate, they will vibrate into specific patterns, revealing where the least amount of resonance occurred at a specific frequency. This was immediately practical for building more resonant church bells. 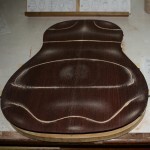 Today, the same methods are applied to wood by luthiers like Randall Kramer. Kramer uses an electronic signal generator made by Bradley Engineering, and some sawdust sprinkled on the back or soundboard, to reveal the same sort of patterns across a wide range of sonic frequencies. Through a complex and time consuming process, he is able to gain detailed information necessary to fine tune the thickness of the top and back, and the shaping of each brace, making sure they will “resonate at optimum efficiency throughout their frequency range so every note can reach its full potential,” while also reducing the chance of wolf notes or dead notes along the entire fingerboard. And he has managed to tease out about as much tone, sustain and harmonic complexity as may be possible from this 12-fret 0000. Not only does it ring true no matter where one depresses the strings, the notes adapt marvelously well to how hard or soft the string is voiced, growing succulent or drawing into focus based on what the guitarist’s two hands are doing at any given moment. All the exquisite materials, skill, and extra effort that go into the creation of such a guitar come out as beautiful tone. This is the kind of guitar that inspires one to create new music and hear old music revitalized. This is a guitar one wants to record an album with. Across all six strings and their harmonic range there is a fullness that results in presence, projection and balance all at the same time. But it is an ethereal fullness. It is actually a lightly built instrument and the dynamics are similar to a pre-war fingerstyle guitar more than one of the heavier, wall of sound guitars filling most music shops. This guitar is so finely tuned in terms of dynamics and response that it is basically effortless to play, in any tuning. There is a gorgeous complexity to the harmonics, but an unperturbed clarity to the fundamentals, and an organic sensibility to the sustain and decay of each, which makes it a delight to play. It inspires a guitarist to improvise and explore the sonic possibilities of this artful construction of wood, metal and bone. It is hard to put down, and invites long sessions of playing for the pure pleasure of hearing the instrument sing. Read more about Randall Kramer and his use of Chladni plate tuning HERE. Here are two supplementary videos. First, the owner demonstrates some of the music he plays on his Quartet. 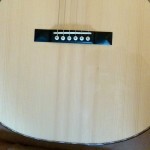 Then, since many people use these kind of guitars for alternate tunings, a short example of the Quartet in DADGAD tuning. If you like our Youtube videos, please say so!